I have no idea what has happened to the leading on this type but my knowledge of HTML is insufficient to fix it, you'll just have to stick with me! 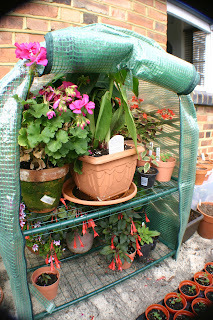 Well, everything has been removed from the windowsills (dry compost+wind=disaster), the hose will come out once the flower market's finished to give everything that needs it a last drenching (arilbred and juno irises exempted) and any seed tray/pot that can has been cling-filmed to keep the moisture in, although I think the Iris sibirica seedling (yes, one so far) might just carry on up through it, which is better than a bent seedling, I suppose. The greenhouse will be zipped up and fingers crossed as I leave my babies to fend for themselves for a few days as I head of to 39C in Egypt (not good, I have ginger hair, but I will be spending a lot of the time 30m down indulging in a bit of marine biology). 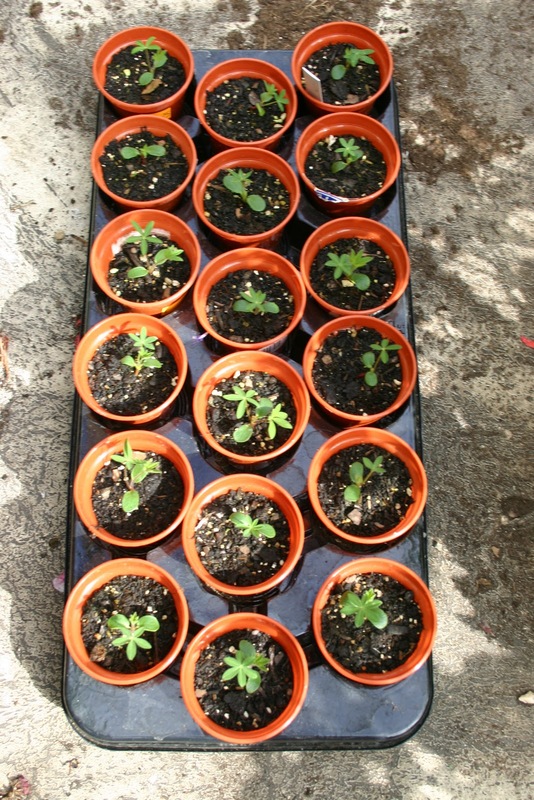 There is still plenty of action: I've got 9 lily seedlings now, a smattering of Delphinium zalil, plenty of candelabra Primula species seedlings (of course I won't know what they are until the flower and even then it's not that simple with the variability within species). 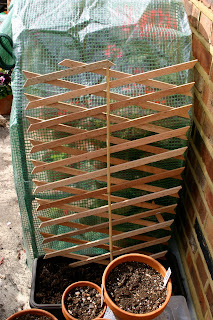 The primulas: honestlty there are at least a dozen in there! The Iris "Eye of the Tiger" has clearly lost its iPhone cos it has no idea that it's not spring and won't be for a considerable time, but there are plenty of antirrhinum seedlings in the same pot so I'll get something out of it! The moisture/shade lovers such as Mecanopsis have been carefully placed to get any rain but little sun. I can but hope that you have a week of light, steady rain (sorry) so it can trickle down to thing like the Rhododendrons which do themselves no favours by covering the pots with a thatch of leaves. 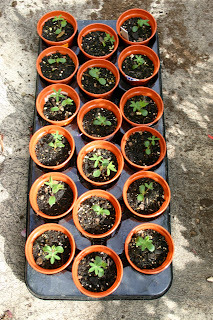 I'm delighted with the Lupin seedlings, they look like Lupins now and the Dianthus knappii have transplanted successfully after sulking for a few days. All in all I'm pleased with how year one has gone, especially when I saw several people in the courtyard outside (only open Sundays) taking pix of it. Year two will be all about finding space and hopefully enjoying a stunning display of Irises of all hues and sub-genus. 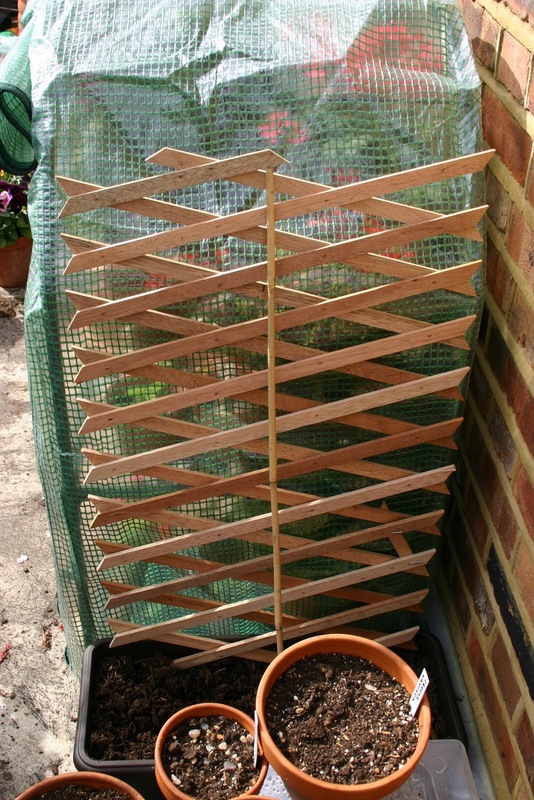 Oh, and here's my DIY to take the Lathyrus chloranthus.